Whats still on the table? THE INTERREG. PROJECT #HERINNERINGEN (#MEMORIES) HAS RELEASED ITS SECOND NEWSLETTER. TOXGENSOLUTIONS BV INVITES APPLICATIONS FOR A POSITION AS EXPERIENCED RESEARCHER, STARTING JANUARY 1, 2019. 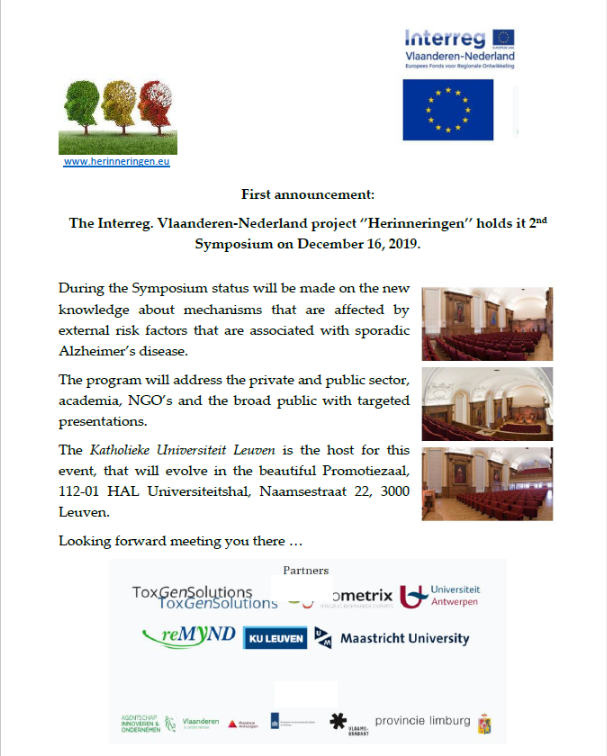 YOU ARE HEREBY CORDIALLY INVITED TO THE FIRST ANNUAL MEETING ON NOVEMBER 23TH 2018 IN BUILDING ON1 AT THE KATHOLIEKE UNIVERSITY LEUVEN (HERESTRAAT 49, LEUVEN). @TOXGENSOLUTIONS BV DISEMBARKS ON ITS DATA-DRIVEN JOURNEY TOWARDS NOVEL TOOLS AND TREATMENTS FOR IMPROVING THE QUALITY OF LIFE OF PATIENTS WITH SPORADIC #ALZHEIMERS. The #interreg project #Herinneringen applies #animalfree approaches to understand the #adverseoutcomepathways (#AOP) driving sporadic #alzheimersdisease. TGS is valorising a human relevant test method, based on a specific biomarker profile representing Alzheimer’s related neuronal processes before cell death occurs. Many thanks to the participants, and especially the speakers: Catherine Verfaillie (KULeuven (host)), Francesca Pistollato (EURLECVAM (invited speaker)), Annemie Ribbens (icometrix), Sebastiaan Engelborghs (UAntwerpen), Gerard Griffioen (reMYND), Jacco Briede and Rob Schlooz (UMaastricht) and Erwin L Roggen (ToxGenSolutions). 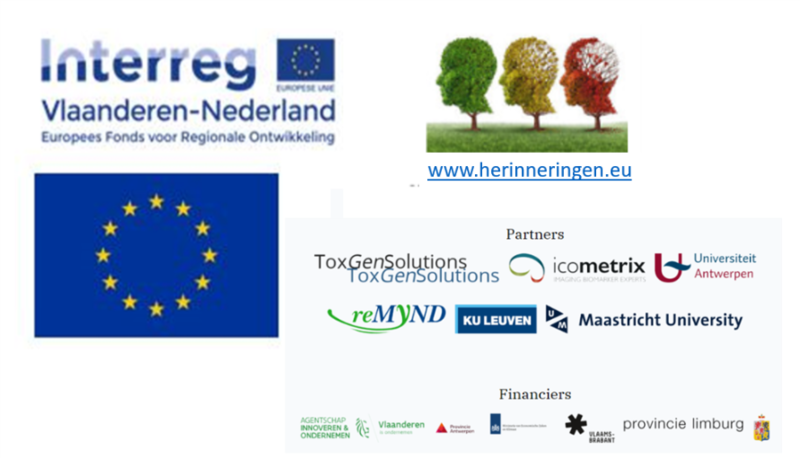 The presentations will soon be available on toxgensolutions.eu. You see you self as a researcher at a spin-off company based at the University of Maastricht with an ambition to expand. The research field is Neurodegeneration of the human brain, with focus on Alzheimer’s Disease (AD). The successful candidate will participate in an AD project supported by EU Interreg. Vlaanderen – Nederland, het Nederlands Ministerie van Economische Zaken, de Provincie Nederlands Limburg, Vlaams Agentschao Innoveren en Ondernemen (VLAIO) and the Provinces of Antwerpen and Vlaams Brabant. Experimental planning of the project, problem solving and assuring compliance with the timelines of the project. Laboratory work within the field of microRNA detection. Performance of differential (epi-)genomics and pathway analyses. Handling and reporting of experimental data. Preparing microRNA profiles with diagnostic value for the market. Applicants should have a PhD degree in (epi)genomics or equivalent with several years of experience. You have experience with and enjoy laboratory work. You have hands-on experience with state-of-the-art (epi-)genomics technologies. Experience in bioinformatics will be considered an advantage. You communicate fluently in English. You can work with deadlines and pressure. You are flexible, enthusiastic and responsible, with team spirit and excellent collaboration skills. ToxGenSolutions BV offers a competitive scientific environment with the ambition to build a self-sustainable company applying front-edge non-animal toxicogenomics approaches on human health problems to provide the customer with genetic biomarker fingerprints for application in novel more accurate methods for diagnosis, novel tools for follow-up of disease progression or response to treatment in humans, and novel drug development. The appointment will be based on the current wage scales that are applied by the University of Maastricht. The position is for two years. For additional information about the position, please contact Erwin L Roggen (erwin.roggen@toxgensolutions.eu). You can read more about ToxGenSolutions BV on www.toxgensolutions.eu. Please submit your application no later than December 10, 2018 (Local time). Applications and enclosures received after the deadline will not be considered. The project ‘Herinneringen’ (‘Memories’) is about to finish the first year of its search for a cost-effective and minimally invasive method allowing for accurate diagnosis of (sporadic) Alzheimer’s disease (AD) before significant damage to the brain has occurred. You are hereby cordially invited to the first annual meeting on November 23th 2018 in building ON1 at the katholieke University Leuven (Herestraat 49, Leuven). Participation is free but registrations via the project web site (Menu, Contact) is required for practical reasons. The program can be downloaded from the same web site. Francesca Pistollato from the European Reference Laboratory – European Center for validation of Alternative methods to Animal Testing (EURL-ECVAM) will address the current challenges met by traditional AD research, and the need for the paradigm shift that forms the basis of the project ‘‘Herinneringen’ (‘Memories’). The project partners will present an overview of the different activities that are planned to meet the final goal, and progress will be reported where relevant. Special attention will be given to (i) the selection of the external risk factors for sporadic AD; (ii) the cell-based methods for identification of molecular and cellular processes that may be involved in the onset and early development of AD-related processes; (iii) the strategies to scientifically validated the human relevance of the identified potential biomarkers. See you November 23th. February 09, 2018 @TozGenSolutions and its partners in the project #Herinneringen (”Memories”) have disembarked on their journey towards a technology platform for 1) development of a non-invasive method for early #diagnosis, 2) identification of novel #drug targets and 3) improved #drugdevelopment approaches. The building of the platform is data-driven (as opposed to the current hypothesis-driven strategies) and based on adverse outcome pathways (#AOP) identified using #nonanimal genomics-based methods and involving cell models, and matched human clinical samples and human cohorts. The overall objective is to break the current deadlock and to provide patients with sporadic #Alzheimers with novel tools and treatments that improve their quality of life. 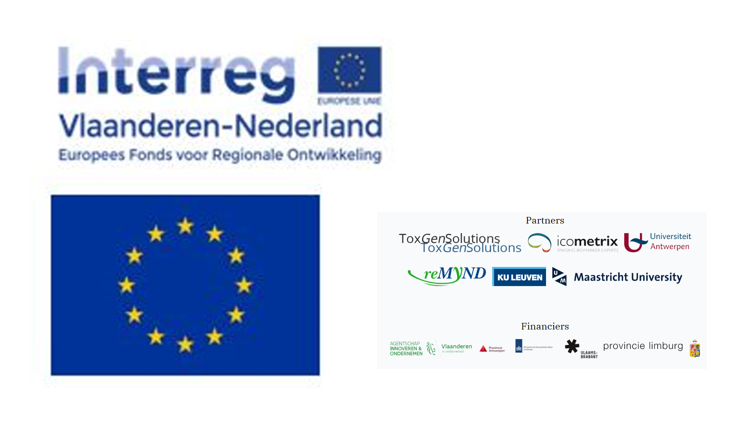 Every partner in the consortium (icometrix, Katholieke Universiteit Leuven, reMYND, ToxGenSolutions, Universiteit Antwerpen, Universiteit Maastricht) is based in Flanders and the Southern Netherlands and is a leader in their professional field. Bundling these strengths and the resulting synergy will serve as a great stimulus for targeted innovation. The total budget for “Memories” is €2,476,613.03. The project will run from January 1, 2018 up to and including December 31, 2020. The budget is provided by public organizations, such as Interreg. Vlaanderen-Nederland, the Dutch Ministry of Economic Affaires, the Flemish Region and Provinces. A VIRTUAL GENERIC GENOMICS-BASED PLATFORM THAT PROVIDES ANSWERS TO YOUR QUESTIONS ABOUT SAFETY AND EFFICACY OF YOUR PRODUCTS. A systems-based technology platform for profiling the positive as well as negative impact of your product on biological response and human health at realistic concentrations and under relevant exposure regimes. Our toolbox contains a breadth of technologies, systems, and pathways of toxicity and common nodes of toxicity developed by the Netherlands ToxicoGenomics Center (2008-2013). The ToxGenSolutions toolbox is flexible, faster than traditional methods, more economical and more relevant for human safety and health. ToxGenSolutions products are proprietary mechanism-based gene signatures for identification and classification of toxicants during screening, product development and safety assessment. ToxGenSolutions provides a cutting-edge patchwork of test methods required for modern testing and assessment of compounds and products. ToxGenSolutions builds on a virtual generic platform of leading test and technology developers providing novel technologies addressing key events in outcome pathways. ToxGenSolutions develops testing and assessment strategies for, and with, you to assure optimal coverage of your needs. ToxGenSolutions develops strategies considering the nature of the test substance, the intended application, likely exposure routes, product development status and legislation. THE WORKING HYPOTHESIS IS THAT THE COMBINATION OF EXPERTISE AND TECHNOLOGY FROM DIFFERENT DISCIPLINES WILL PROVIDE THE UNDERSTANDING OF HOW CHEMICALS INTERACT WITH BIOLOGICAL SYSTEMS THAT IS REQUIRED TO IMPROVE HUMAN SAFETY AND HEALTH. IMPROVING #ANIMALFREE TESTING AND ASSESSMENT BY COMBINING PHYSICO-CHEMICAL/STRUCTURAL ANALYSIS AND BIOLOGICAL PATHWAY ANALYSIS OF EXPOSED HUMAN CELLS AND TISSUEL. (Q)SAR modeling is currently used to identify chemicals that are most likely to become a product,by having desired physico-chemical/structural characteristics (e.g. new leads for drug development), and by not exhibiting characteristics known to exert adverse effects in humans (e.g. hazard identification and safety testing). It is currently not well established how well current (Q)SAR models discriminate chemicals with similar physico-chemical/structural characteristics but different in vivo outcome. This is a problem e.g. when in vivo animal models incorrectly indicate unsatisfactory efficacy or toxicity. ToxGenSolutions BV envisages a novel quantitative systems biology approach for toxicity assessment linking physico-chemical characteristics of test compounds ((Q)SAR) with biological impact on cells/tissues, providing more accurate human health and safety where in vivo animal models fail. A NOVEL THERAPY FOR SLOWING DOWN THE PROGRESSION OF NEURODEGENERATIVE DISEASES THROUGH A BETTER UNDERSTANDING OF THE IMPACT OF ENVIRONMENTAL CHEMICALS ON NEURODEGENERATION INDUCTION. The incidence of neurodegenerative diseases (e.g. Alzheimer’s, Parkinson, multiple and amyotrophic lateral sclerose) is globally on the rise, and the increasing number of patients is challenging the existing medical care ressources. 2. The blood-brain barrier allows only chemicals with specific physicochemical charactereistics to enter the brain. ToxGenSolutions BV envisages a project addressing the mechanistic aspects (Hurtle 1). -Omics approaches based on human stemcells and tissues are anticipated (i) to provide better and more relevant knowldege about the mechanisms affected by environmental factors and driving the induction of neurodegenerative diseases in humans, and (ii) to allow for the identification of human-relevant early biomarkers. Thus, the acquired knowledge offers new opportunities for the development of novel more accurate methods for early diagnosis of disease induction. In addition, alternative targets for novel anti-neurodegenerative drugs are anticipated to emerge from this project. Do you have any questions to our services then you are welcome to contact us today. Call us or send an email and then we will reply as soon as possible.